Starting today I am going to write a series on C programming. I wish to cover all the basics and will mostly write programs. As a user I would like you to put your valuable comments, doubts and opinions to make this more resourceful and fun to learn. Now we are ready to start. I would try to make this tutorial colloquial for easy understanding and reference. If you want to go in depth about some topic, you could always look it up on Google. Turbo C Compiler is the most common and renowned compiler used for ages. Unfortunately, it does not support on Windows versions from Vista. Of course, there are many ways of getting it done. Let’s start for Windows. 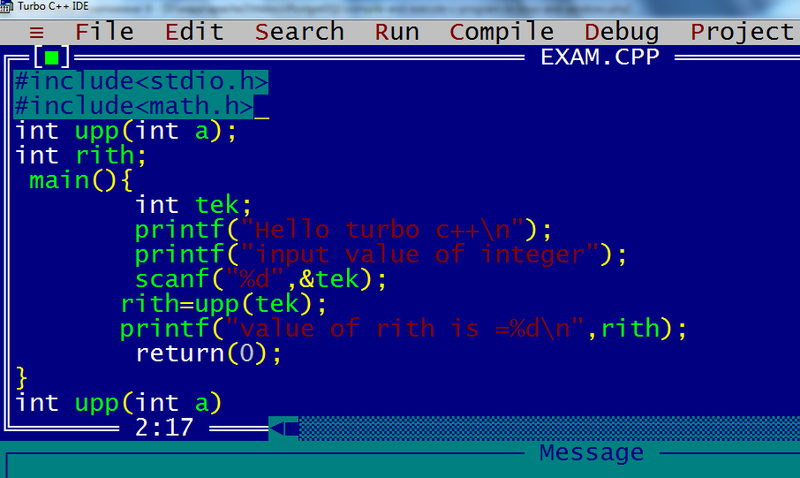 Turbo C is the best compiler for Windows XP/Vista. You can download it here. Just unzip it and follow standard installation procedure. The problem with Windows Vista is the fullscreen issue. I am sure there are solutions online. Turbo C can be used on Windows 7 using DOSBox. DOSBox is an emulator of DOS operating systems. For installation and download you can refer to this awesome post. You don’t need to download anything. That’s the reason why I love linux. GCC is an awesome inbuilt compiler based in Linux systems. Just write your program using Gedit or Nano and compile it using gcc. I am not a Mac OS X user but I guess you can compile C files using Apple Developer tools. GCC is also available for Mac OS X but it’s not inbuilt. Look it up online or donate me a Macbook for further help. C4Droid is an awesome android application that helps you to compile C programs on any android device. It’s paid. You can find it here. No luck here unless you jailbreak your iPhone. If you already have use GCC. Now that you have installed your compiler and other required stuff, it’s time to write a Hello World program. So that was basic C Installation and a Hello World program. Stay tuned for more tutorials. Please write to us your valuable suggestions/comments/opinions.